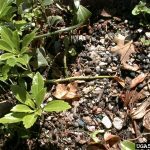 I have a large patch of about 5 ft. by 4 ft. which is completely bare amongst a full area of pachysandra which still appears healthy. The area of infection is spreading, however. 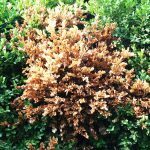 What chemical can I purchase to get rid of the blight? It was diagnosed by Va Extension service.